*We use personal data you provide to us to send you emails with information about our products and services, and to tailor emails and advertising based on what you have shown interest in or buy from us. 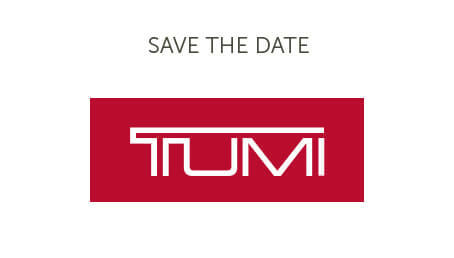 ‘We’ means Tumi D2C GmbH, Hans Böckler Strasse 6, 59423 Unna, Germany. To facilitate social sharing functionality that you choose to use. We will engage in this activity with your consent or where we have a legitimate interest. We aggregate Personal Information so that it will no longer be considered Personal Information. We do so to generate other data for our use, which we use and disclose for any purpose. You can consult the list and location of our affiliates at www.aboutbags.com. Affiliates as used in this document means the entities controlled by, under common control with or controlling us. We seek to use reasonable organizational, technical and administrative measures to protect Personal Information within our organization. Unfortunately, no data transmission or storage system can be guaranteed to be 100% secure. If you have reason to believe that your interaction with us is no longer secure, please immediately notify us in accordance with the “ Contacting Us” section below. Our sharing of your Personal Information with affiliates for their direct marketing purposes: If you would prefer that we not share your Personal Information on a going-forward basis with our affiliates for their direct marketing purposes, you may opt-out of this sharing by contacting us via www.aboutbags.com. Our sharing of your Personal Information with unaffiliated third parties for their direct marketing purposes : If you would prefer that we not share your Personal Information on a going-forward basis with unaffiliated third parties for their direct marketing purposes, you may opt-out of this sharing by contacting us via www.aboutbags.com. If you would like to request to review, correct, update, suppress, restrict or delete Personal Information that you have previously provided to us, or if you would like to request to receive an electronic copy of your Personal Information for purposes of transmitting it to another company (to the extent this right to data portability is provided to you by applicable law), you may contact us via www.aboutbags.com or by writing us at the address mentioned in the ‘ Contacting Us’ section. We will respond to your request consistent with applicable law. If you are located in the European Economic Area (comprised of the EU Member States, Iceland, Liechtenstein, and Norway, together “ EEA”): Some of the non-EEA countries are recognized by the European Commission as providing an adequate level of data protection according to EEA standards (the full list of these countries is available at: http://ec.europa.eu/justice/data-protection/international-transfers/adequacy/index_en.htm. For transfers from the EEA to countries not considered adequate by the European Commission, we have put in place adequate measures, such as standard contractual clauses adopted by the European Commission to protect your Personal Information.